A little over two years, back in the equal frosty days of January 2010, I decided to start posting vintage recipes here on a relatively frequent basis. Prior to that time, I'd been sharing some of my own beloved dishes with you, as well as the occasion yesteryear recipe, but it wasn't until then that I'd began writing about some of the many classic, sometimes zany, often dead simple, almost always taste bud pleasing vintage recipes I'd been bookmarking and favouriting over the years. Long time readers my remember that said post featured a recipe for good old-fashioned Welsh Rarebit. As a way of celebrating two plus years of fantastic vintage recipes posts, I thought it only fitting that today's recipe be, once more, for a rarebit filled meal. 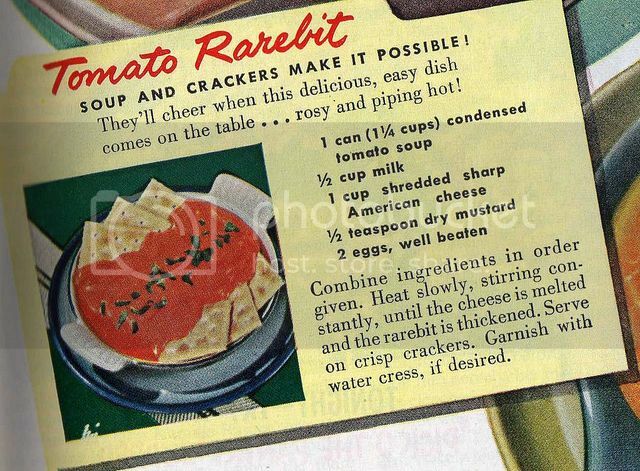 Unlike the original - and very traditional - recipe from a couple of years ago, this one from the 1950s calls for the inclusion of canned tomato soup. To said soup, one merely adds milk, shredded cheese, dry mustard and two eggs. It really does not get any easier than that, in my books. This is the kind of inexpensive recipe that you can whip up at a moment's notice, and which is both filling and warming in the same go - an absolute must for most lunches and dinners during this especially chilly stretch of winter. If you're not a fan of mustard, by all means forgo it. You could instead add some paprika, chili powder, curry powder, freshly cracked black pepper (I'd add pepper no matter what), oregano, marjoram, basil, thyme, or chervil. Have fun and play around with the cheese. Why not channel a pizza vibe and use mozzarella, some fresh basil leaves, a little garlic, and perhaps a handful of sliced black olives or fire roasted red peppers? You can certainly serve this tasty rarebit over crackers, as suggested, or branch out and try it drizzled atop everything from cornbread to (savoury) waffles, fluffy buttermilk biscuits to hefty sized slices of dense focaccia bread. You could also keep it warm in a fondue pot or chaffing dish and spear little cubes of bread, biscuits, crepes, or Indian naan into it for an extra fun twist on a great vintage meal. I personally make this for myself with Campbell's Tomato with Basil and Oregano soup, which is gluten-free (very few Campbell's soups are, but this one is and is clearly identified as such on the label), forgoing the eggs (I'm allergic) and cutting the milk (or milk alternative, such as rice milk) down to no more than 1/4 of a cup. I like to serve it over Glutino brand gluten-free Table Crackers, as they're egg-free and somewhat similar to a classic saltine. Sometimes, if I have any on hand, I've also dipped fresh homemade gluten-free savoury scones into this flavourful sauce in the fondue manner described above. Tomato soup has always been a favourite of mine, so I love that with some tweaking, I'm still able to enjoy this quick, flavourful take on rarebit. In my experience, rarebit, be it the traditional or tomato version, is a hit with dinner guests of all ages, from toddlers on up, and the perfect thing to make on the fly if you suddenly find yourself with unexpected company during these freezing cold days of January on into February (especially since most people have canned soup, milk, eggs, cheese, and crackers on hand almost all the time). It's been nothing short of a joy to share two years of vintage recipes with you, and I eagerly look forward to many more years of fun, memorable old school eats to come! Congrats on your two year anniversary of sharing recipes. I love looking at recipes women used to cook. I know what you mean. Now that the daily high hasn't reached over 38F I've been making more soups and body warming food. I'd like t try this but the hubby doesn't really care for tomato based foods. Thank you very much - it's hard to believe so much time has flown past since the first vintage recipe post already. It's been a joy to share so many yummy, unique, classic, and flat out fun recipes with you, and I look forward to to continuing to do so this year (and beyond!). Ok, I have to admit that when I read the title of this post I thought it said "Rabbit" so then I looked closer and saw that it said "Rarebit". Well, I had never heard of a rarebit so I googled it and discovered that it meant rabbit in a sense of humor kind of way. Anywho, thought that was funny and wanted to share. This recipe sounds delicious and something I could go for right about now to warm my old bones. I always read it as "rabbit" in my head, too! :) I don't think we're alone either, as I've heard other people say the same thing in the intros to recipes before. That is funny for sure, thanks for sharing that it means rabbit in a funny kind of way. This recipe is soooo yummy! I hope you get a chance to take it out for a test drive, so to speak, soon. Rarebit was much more common in North America during the 1930s, 40s and 50s, and I'd venture to guess that many of my generation have never tried or heard of it. My mom would sometimes make it when we were little though and I've loved it ever since. This surely brings back childhood lunch memories--tomato rarebit on toast, sprinkled with cheese and put under the broiler for a few seconds. Yum! I really enjoy the recipes you post for us, and have revisited your vintage cocktails for New Years! Such fun! Your organization of the recipes makes it a very easy cookbook to use! I've never heard of rarebit either. It's nice to read about old, vintage recipes. I hope you'll keep on sharing them. Hi Annie, I love vintage recipes - whether I make or can eat them or not, I just adore reading them, soaking up the culinary history of the era, and sharing some of my favourite finds here. It's a joy to do so and I have no plans of stopping any time soon, so there will plenty more fun yesteryear recipes to come here in the future.